If there is one thing the Boston Bruins know how to do, it is battle. They have battled all season long and it is the reason why they are one game away from a trip to the Eastern Conference finals. The Black and Gold battled throughout the whole season with a lack of scoring and even bounced back from a 10-game losing streak in February. For most teams, that would be the end but the Bruins are resilient. Boston has faced injuries all season long, losing Savard, Lucic, Stuart, and Ference for good portions of the season and then losing Seidenberg, Sturm, and now Krejci for the playoffs. When the Bruins lost Savard after the Cooke hit, all hope seemed lost. They had to battle to get into the playoffs and battle they did. The next step was to get through round one without Savard and they did that. Then it all came together when Savard returned to play for the B’s in round two. The Bruins were finally complete and could finally compete harder. poise and patience of a seasoned veteran. And now we have lost him and Savard will have to get back on his horse a little quicker and step up big time. Even with the loss of Krejci, it does not seem like the end of the world. This team has been through so much and battled through every already that there is a sense of confidence surrounding them. They are not supposed to be in the playoffs anyways. Every injury is just a test and so far the Bruins have passed them all due in large part to the depth of their farm system. Let’s not start failing now. 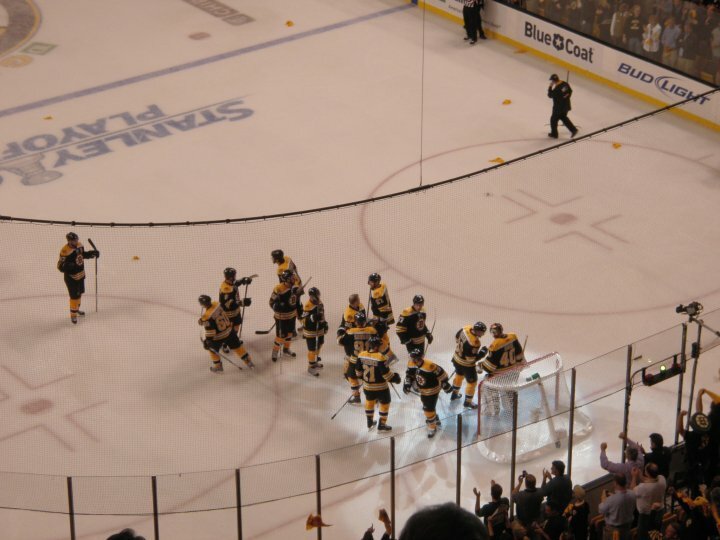 Before the Bruins lost Krejci, their play was nothing to be excited about. Yes, they beat the Sabres in round one and yes, they are up 3-0 on the Flyers but they could still step up their game. Don’t get me wrong, if this kind of sloppy play gets them a Stanley Cup, I won’t be complaining. However, right now, their power play is despicable. They have scored power play goals but overall, it has not looked good but this is nothing new from the regular season. It is just more frustrating in the postseason. Losing Krejci will only add to the lack of power play unless others step up big time. In the absence of Krejci, Sobotka will slide back into his natural position of center on the third line. Marchand of Whitfield will most likely make their first appearance in these playoffs. If Marchand plays, it would be his first NHL playoff game and Whitfield would be making is first playoff start for the Bruins. Both guys have the ability to step up. Marchand will bring a hard-charging, aggressive style of play to the game and could complement Begin and Thornton on the fourth line. Whitfield may be the safer bet because he can fill the void of having a more veteran presence and being able to take up time on the penalty kill. No matter who it is, he will have to step up and show up ready to play hockey. Flying under the radar this whole postseason has been Adam McQuaid. He has played solid as the sixth defenseman. Unfortunately, he also left early in last night’s game with an injury. There has been no update yet on what kind of injury or if he will play tomorrow. That is just a tough break for a tough guy who has been playing great in his first NHL postseason. The only good news that could come from this would be if Mark Stuart is finally ready to come back for game 4 after missing time due to an infection in his hand. Whatever the injury situation may be, the Bruins still have hockey games to play. They can take the series tomorrow with a win and start preparing for the Eastern Conference finals against Pittsburgh or Montreal. I have to say, I wouldn’t mind if the Bruins lost tomorrow because then they could win at home but then again, I’d rather just have them finish business as soon as possible. It’s May 6 and the ice at the Garden is still frozen. Can you believe it? If you asked me in February, I wouldn’t have either but now I believe that the ice could stay frozen all the way into June. The Bruins just need to keep battling until the job is done.